The arms are those of de Vergy, for Jean de Vergy III or one of his sons, Guillaume, or most probably, Antoine. Jean de Vergy III, known as the Great, seigneur de Fonvens who died on 25 May 1418. He married firstly Jeanne de Châlon and, secondly, after 1401, Jeanne de Vienne, widow of Edouard, seigneur de Saint-Dizier. By his first wife, he had three sons. The eldest, Guillaume, seigneur de Port-Fur-Saône married Isabeau de Haute-Ribaupierre in 1377, and was killed in the defeat of the Crusade against the Turks at the Battle of Nicopolis in 1396, as was his younger brother, Jacques. The third son, Antoine, and the most likely owner of this mazer, was comte de Dampmartin and seigneur de Champlit and de Rigney. He was a Marshall of France, a Knight and a Councillor and Chamberlain to King Charles VI as well as Governor of Champagne and Brie. He married firstly in 1388 Jeanne de Rigney and secondly, Guillemette de Vienne. He died on 29th October 1439. 1913 Bath House Inventory, p. 28, no. 147, in the Red Room, in the 'large glazed case near door - Left Hand Division'. 1914 Wernher Inventory, p. 27, no. 139. This extremely rare French medieval covered mazer can be compared with an early-fifteenth-century mazer bowl formerly in the collection of the Abbey of Maubuisson and now in the Musée de Versailles (R.W. Lightbown, Secular Goldsmiths' Work in Medieval France : A History, 1978, pls. XVII a and b). The same abbey also possessed a copper-gilt mounted coconut pot probably made 100 years earlier or so (ibid., pls. XXVIII and XXIX a and b). 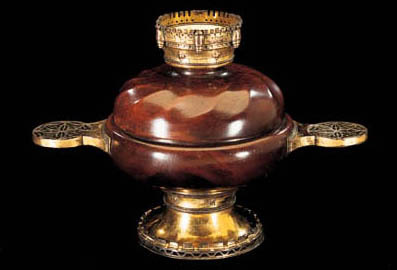 The wooden mazer bowl was made by specialised craftsmen and the client who wanted his bowl mounted would then take them to a gold- or, in this case presumably, a copper-smith, for the additions of foot, handle(s), and finial etc. A gold-mounted example in the collection of King Charles VI was recorded in the Royal accounts of 1416. This had a fruitelet (presumably the finial or perhaps, like the English late-fourteenth-century Swan mazer, an addition to the centre of the bowl), set with a sapphire and pearls (ibid., pp. 20-21).